You'll feel like you're in heaven. 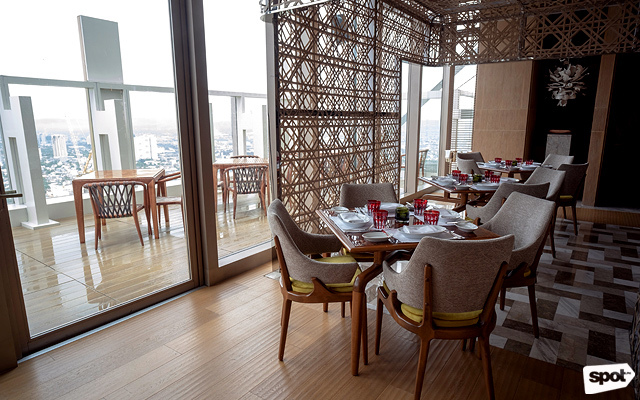 (SPOT.ph) Imagine lounging in the city’s highest roof deck bar with a bird’s eye view of Manila’s vibrant cityscape. Then imagine this while digging into a plate of succulent steak with your choice of libation, to boot. 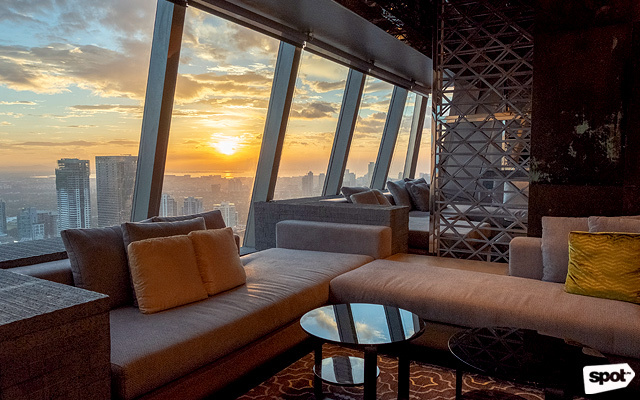 That’s one of the many scenes you can turn into reality at The Peak in Grand Hyatt Manila. Sunlight streams through the floor-to-ceiling windows during the day. The dividers are reminiscent of solihiya patterns. Industrial touches seamlessly go with the interior's traditional themes. 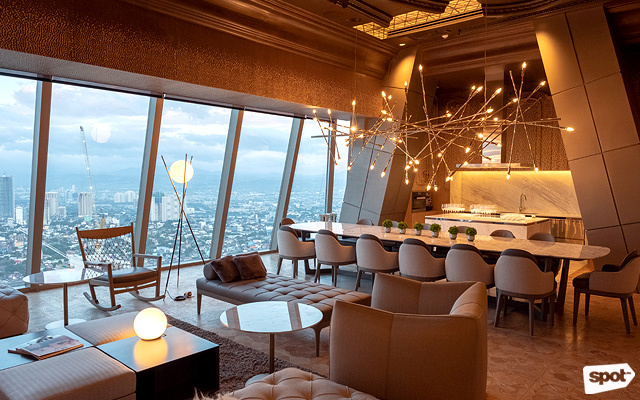 The first thing you'll notice when you step out of the elevator and into the 60th floor is the eclectic mix of industrial and traditional Filipino design scattered throughout its interiors. 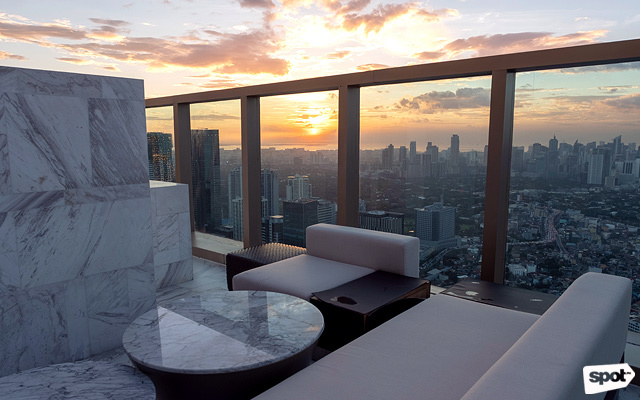 The modern open kitchen with its stainless steel fixtures will steal your attention, but with a quick survey of the area, you’ll see solihiya-inspired room dividers and other conversation pieces. Even the walls by the elevators have embossed patterns that will remind you of tribal tattoos. A mix of charcoal and mango enhances the smoky flavor of their steaks and seafood. 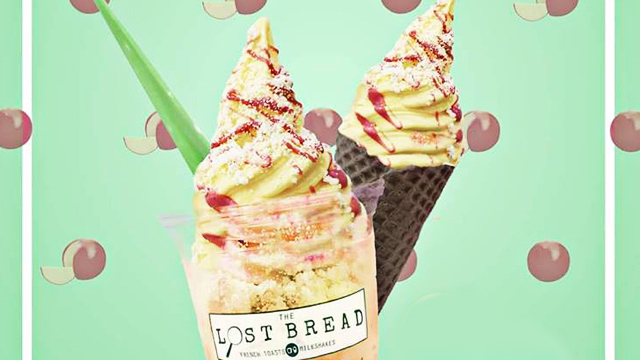 The intricate patterns might just distract you from the food. Make yourself comfortable in the music lounge. The heart of The Peak is The Grill, which features an open-fire charcoal grill. Surrounding tables get a front-row seat to the live culinary show in the kitchen. Grab a personalized drink from the bar. Watch the city lights come to life. Or you can also chill from here. Past the dining area is The Music Lounge, where you can catch live performances by their featured band, Legacy, which plays a good mix of contemporary sounds in between beats from the DJ. 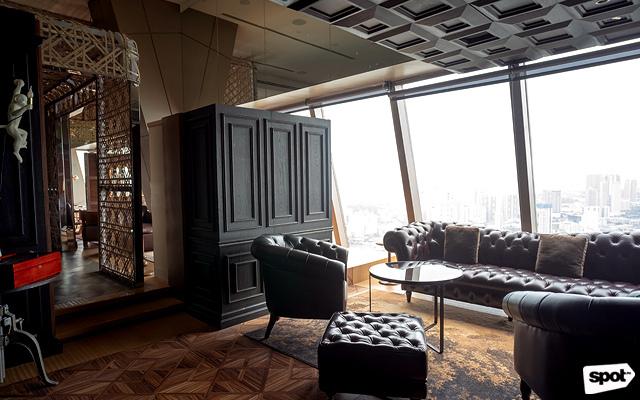 But for an exclusive vibe, climb up the stairs and head to The Peak Bar, where you can enjoy personal service from your private bartender. 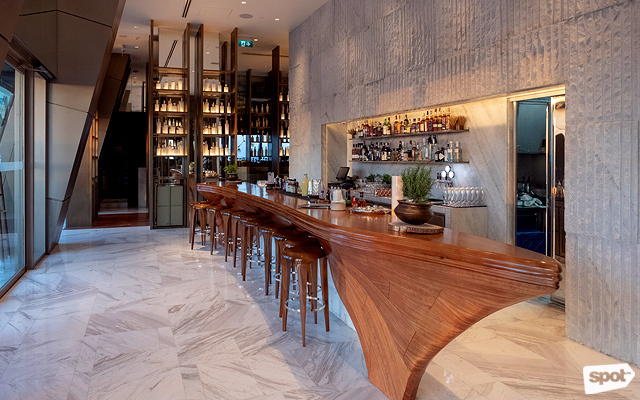 Grab a seat by the customized wooden bar or relax in the outdoor seating area while you have some infusion cocktails. There’s also a Whisky Room where you can have exclusive events for an intimate group. 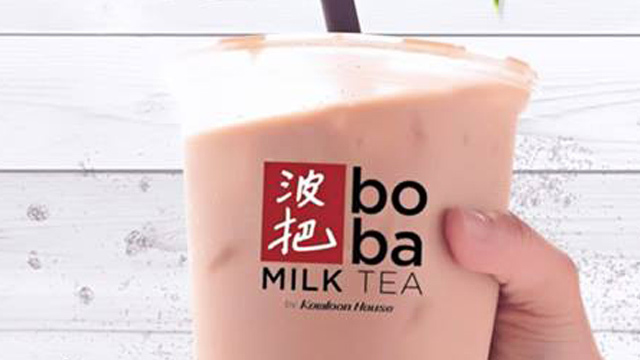 “It’s a destination within a destination because whoever you are, we find a place for you at The Peak,” shares The Peak manager Benjamin Schertzer. 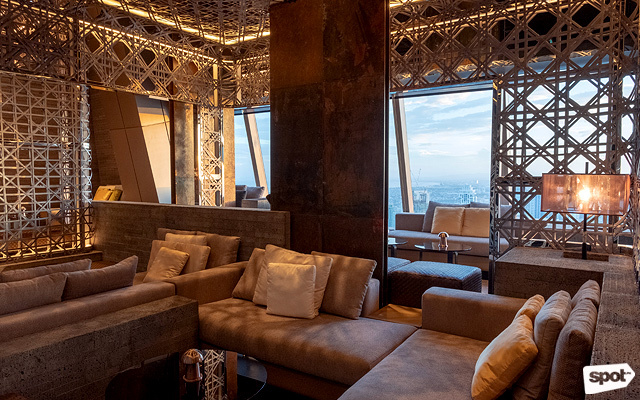 Schertzer adds that it’s the first time that the Hyatt Group has done a concept like The Peak in its 61 years of existence, making it one-of-a-kind among Hyatt’s 777 hotels in 54 countries. 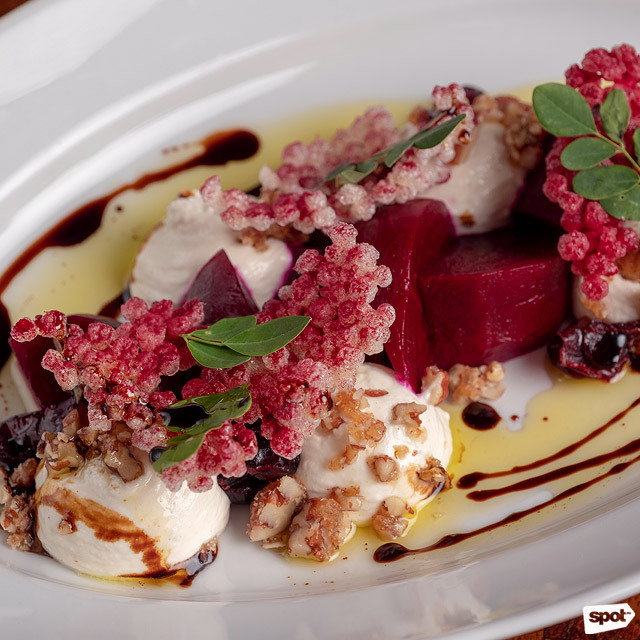 Aged balsamic dressing paired with honey makes the Pickled Beetroot salad a flavorful starter. 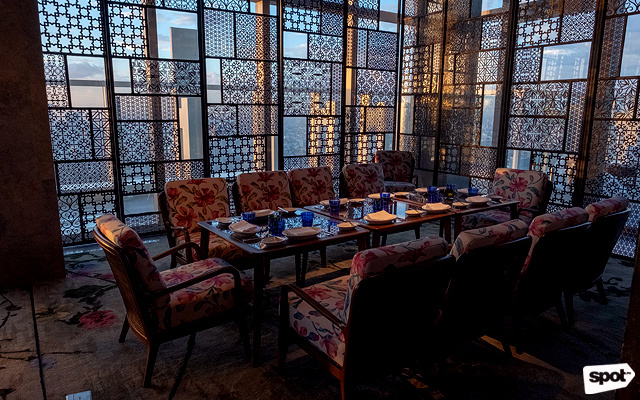 This spacious rooftop bar and restaurant has a pretty straightforward menu, which highlights dishes from the charcoal grill. While waiting for your entrée, start with one of the salad options like the Pickled Beetroot, 15 Year Aged Balsamic (P500), which might just surprise your taste buds. Whet your appetite with the chunks of vibrant beetroot and make sure to get some goat cheese to go along with each bite. A drizzling of honey offers a nice contrast to the earthiness of the dish. Plus, tender sago, pecan nuts, cranberries, and malunggay leaves add flavor and texture to this interesting starter, which is then finished off with a deep, rich, and almost heady balsamic vinegar dressing. 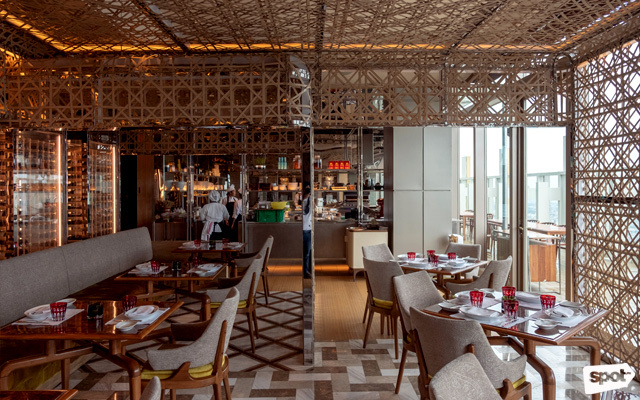 According to Chef de Cuisine Manuel Baenziger, Hyatt has introduced a sustainability program and The Peak is the only restaurant that has achieved 100% in seafood sustainability. “No frozen beef or seafood here, everything is fresh,” he says. Hyatt has also tapped local sources for their produce such as tomatoes and lettuce. They source their other main ingredients from around the world: the steaks, for instance, come from Australia, U.S.A, Ireland. 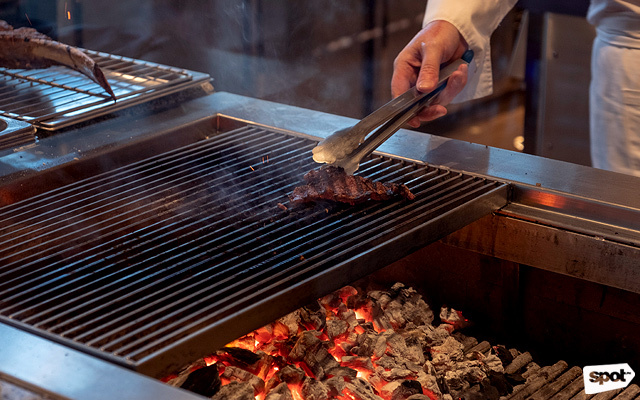 Everything is cooked on a grill that uses a mix of charcoal and mango wood. “The wood itself is very dry and creates a little bit of smoky flavor. It really helps enhance this barbecue-grill taste for our steaks and seafood,” says the chef. 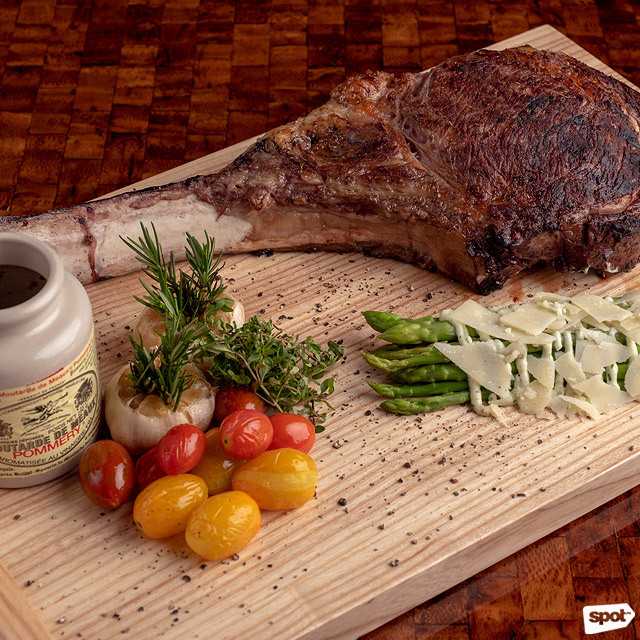 Something that you shouldn’t miss is the John Stone Tomahawk (P6,700 for 35 oz/1,000 gm), bone-in Irish steak that’s good for sharing. 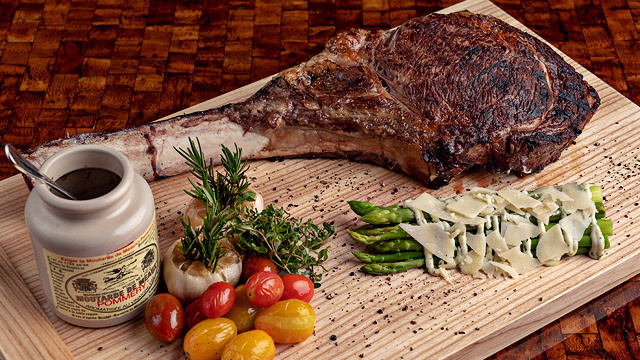 The John Stone Tomahawk is Irish beef grilled to perfection. “We have 30-days dry-age Irish beef from the Irish north coast—free-range and grass-fed. The weather conditions and the local conditions in Ireland make the beef so tasty. They live very near the coast so the grass that they eat, the flowers and the herbs are a little bit salty so it helps create a better flavor in the beef,” the chef explains. He further elaborated that grass-fed beef has a more intense flavor, while the grain-fed ones are more tender and have more marbling. The Peak has the classic cuts like strip loins, tenderloins, and New York strips, but they also offer other, less common cuts like the Irish dry-age rump cab. Go all out and make your meal more luxurious with accompaniments like lobster tail or foie gras. If seafood is more your thing, you can choose between the sea bass or oysters from France, Canadian lobsters, black tiger prawns from Vietnam, or scallops from the U.S. 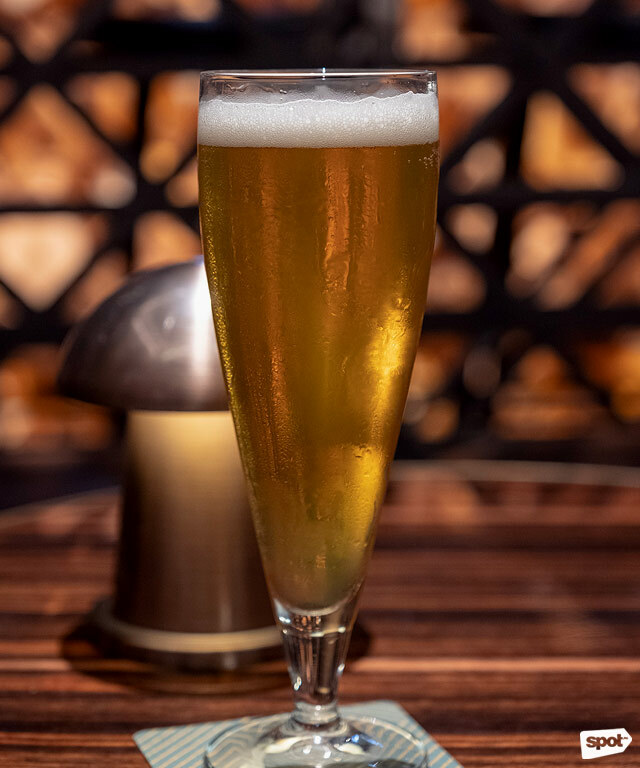 Grab a glass of Craft Beer (P290/330ml), a lager from Engkanto Brewery with a crisp and light flavor. 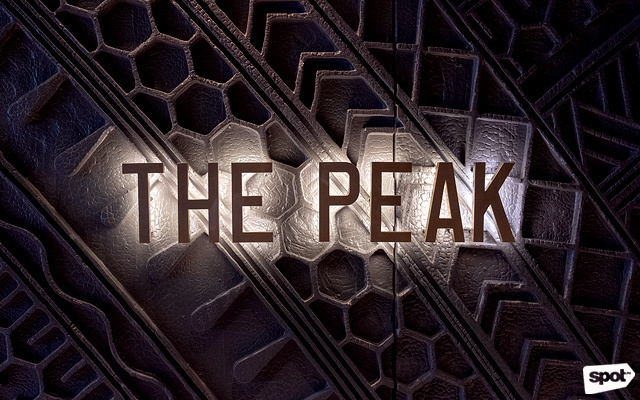 Or opt for something with more buzz like The Peak Sour (P490). 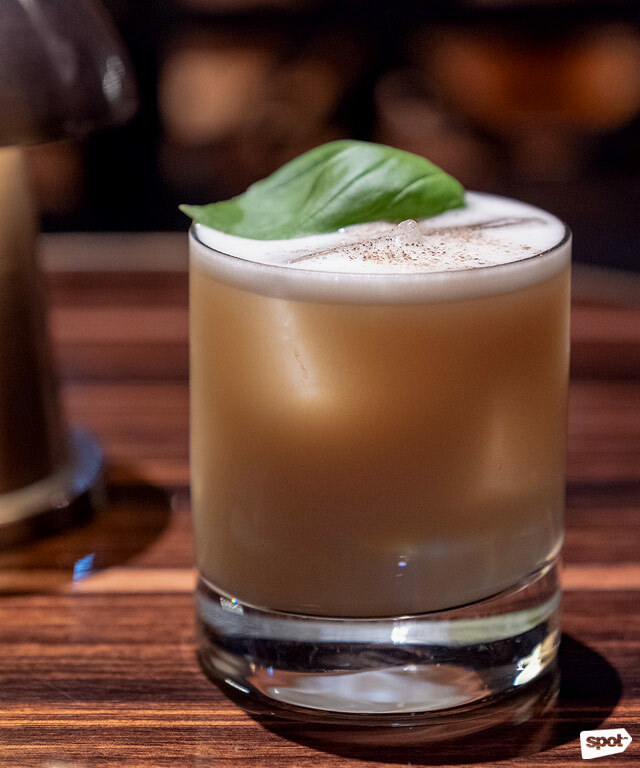 It appears like a typical whisky sour, but better—the perfect drink to have while you say cheers atop the city’s highest peak.